You can comfortably predict any articles about Boston Dynamics will have the words "creepy," "scary," and "nightmare" taking up ample space. Each time Boston Dynamics announces a new robot version—even with few details on technology involved—one is reminded how much alarm the writers experience in viewing the videos. One reads how they won't sleep after seeing the robots walk, run, fall over, get up, and how we are generally doomed because these robots are to take over the world. One wonders if they are really that scared or just seeking to entertain (which they do). It arches, looks, turns sideways, retreats. Another SpotMini appears, this one with the same sleek new body but it also has an arm and claw: Step aside, junior. The enhanced SpotMini has a black contraption on its neck. It is a claw-arm that can work on door handles, and once the handle is turned successfully, it can actually open the door wider for entrance. This machine is a helpful robot, allowing its companion, who has been waiting, to enter first. SpotMini is described by Boston Dynamics's site as a small four-legged robot that weighs 25 kg (30 kg if you include the arm). All-electric, it runs for about 90 minutes on a charge, depending on action. "SpotMini is the quietest robot we have built," they said. As for its special advantage, "SpotMini inherits all of the mobility of its bigger brother, Spot, while adding the ability to pick up and handle objects using its 5 degree-of-freedom arm and beefed up perception sensors. The sensor suite includes stereo cameras, depth cameras, an IMU, and position/force sensors in the limbs. These sensors help with navigation and mobile manipulation." Meanwhile, a number of writers were genuinely impressed with its technical skills. Daniel Starkey in Geek.com wrote that "it's smart enough to understand the correct way to open a door without missing, and it can effectively use its own weight to hold the door open for its friend—an extraordinarily complicated feat of problem-solving that most cats and dogs never figure out." 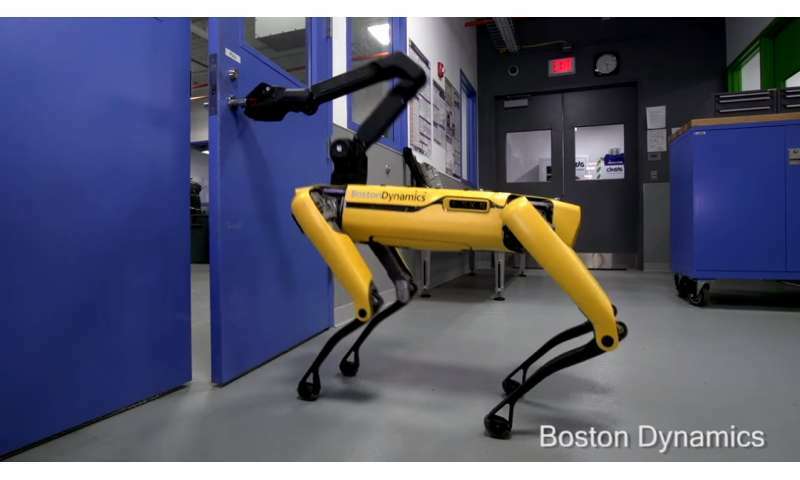 This also impressed Alasdair Wilkins in Inverse: "The finesse of the operation and the various methods the robot uses to open the door as quickly and efficiently as possible is a testament to the robotics brilliance of Boston Dynamics." Michael Hicks in TechRadar: "What we find especially exciting about this news isn't the impressive programming necessary to make the claw arm physically open a door; it's that the robots are trained to recognize doors and door handles. (That's assuming this wasn't remote controlled from off-camera)." "Robots have typically only had limited cooperation with each other, and this hints at more advanced team-ups where robots can supplement each others' abilities and accomplish more than they would by themselves." A real-world translation: search and rescue missions, posed Fingas, "or any situation where it would be impractical to equip every robot with the same features." Brian Heater's thought in Wired should not be ignored: "The team behind the Big Dog proves that it's still the master of viral robotic marketing, even after switching teams from Google to SoftBank." "Daniel Starkey in Geek.com wrote that "it's smart enough to understand the correct way to open a door without missing, and it can effectively use its own weight to hold the door open for its friend—an extraordinarily complicated feat of problem-solving that most cats and dogs never figure out."" All of which can be scripted in. These robots aren't exactly autonomous - they're radio controlled by a human operator, who gives instructions on where to go, how to orient the robot, and the software handles the smaller details like how to position the legs to achieve the angle that the operator is asking. They also come programmed with a number of pre-canned "tricks" they can do, like opening that specific door. It's no more amazing that industrial robots, where a human operator goes through the motions once, and the robot repeats it. See the handler walking around with a radio controller hanging in his lap. The Boston Dynamics robots are basically brainless. They're clever in the way they're able to maintain balance and react to external forces, but all the high level motion planning is outsourced to the humans - which confuses the heck out of tech journalists who believe the robot is responsible for it. The trouble is that the human operator gets very skilled at operating the robot despite its flaws and idiosycracies, so for example, if the IMU is drifting off a little, the human automatically compensates and makes it look very good, whereas if you put an AI in control, it'd bump into walls and do all sorts of crazy things because it simply doesn't have our smarts and processing abilities. It's all still a bit of smoke and mirrors. It looks far more impressive than it actually is. It's kinda like, how people don't believe you can open up a beer bottle with a JBC, but a skilled operator can write their signature on the sand with the digger. If you ignore the man behind the sticks, that's pretty impressive for a "robot". Though it's interesting to watch the commentary online. The journalists and lay public alike split into two camps, where one instantly jumps off into la-la land about how the robots can now co-operate and do this and that - without bothering to find out what's really going on. Future is here. It's pretty much the same people who rave on about the singularity, or about self-driving cars, or any "tomorrow-tech" that's only just possible today in some limited sense, but because it is possible to make a show of it they believe it's actually doing what the hype says. Have you seen the taxi drone craze hype in the news lately, all the hype of it being flown autonomosly, no pilot needed, just climb in sit back and relax, i believe air taxi's is going to be a huge revolution for sure. But the truth is, when that happens, there is no way that people as we know them will climb slap silly alone into a drone to take them happy go lucky to their destinaitons. There will have to be a drone pilot ready to take control should the need arise. Planes have been flying autonomosly for many years, have you ever seen anyone stepping into one though without wanting to know who their Captain is or at least know there is one ? For deliviries sure, no pilot needed, adding people to the mix, the ball game changes entirely. Correction... even for deliveries you will need a pilot to be on standby.